JUST SET IT AND LET IT WORK !! - VERY EASY INSTALLATION. Just connect the controller to a water source and connect a hose or pipe to bring the water to the area to be irrigated. 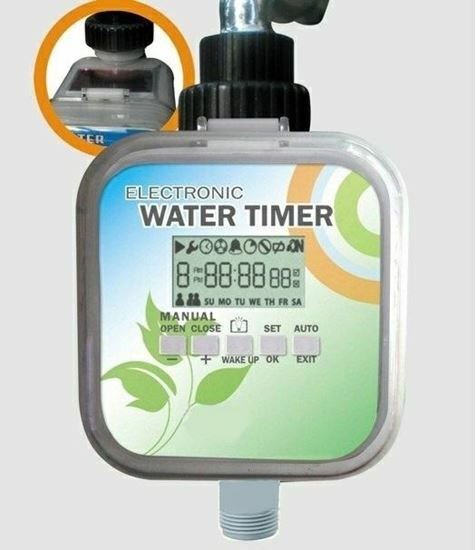 - It can be used for pressure irrigation, gravity irrigation and dripping irrigation. - Auto sleep mode shuts the LCD panel down after 1 minute of not operation to save batteries. - Rain off sensor function automatically overrides programming during wet period. It will automatically resume programmed events after sensor dries. - Working pressure: 0-70 PSI. - Irrigation frequency: can be controlled through preset programs. Up to 8 events of irrigation can be scheduled to open/close the valve daily. It can also be set to a random loop group in any date and in this case it can be set to 3 hours, 6 hours, 12 hours or from 1 day to 30 days to loop and control the irrigation function. - Each event can be programmed from one minute to nine hours and fifty-nine minutes. - Cycle time (random loop mode) is from three hours to thirty days. - Manually operate ON/OFF function. - Power Pack: 2 AA rechargeable batteries (not included) maintained by built in Solar Panel.